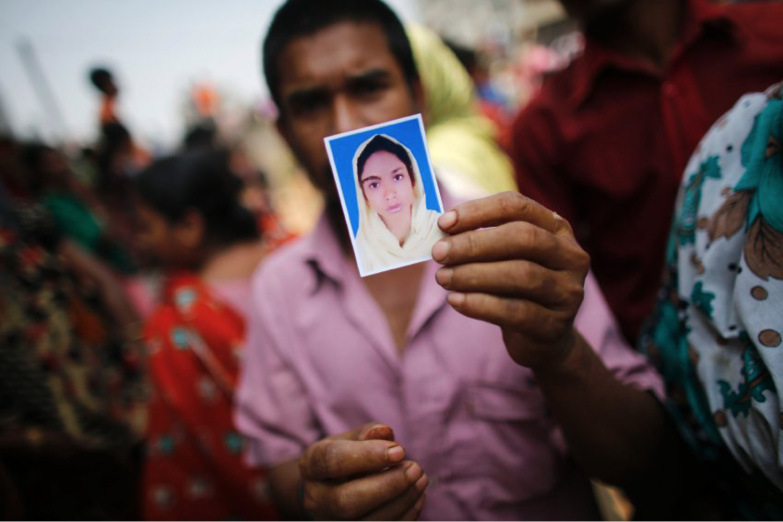 Source: Weronika, (CC-BY 2.0, 2013) Figure 9.1 A relative of one of the workers in a clothing factory at Rana Plaza, Bangladesh, holds up the picture of his missing family member, presumed dead. On April 24, 2013, at Rana Plaza on the outskirts of Dhaka, Bangladesh, a building containing apparel factories collapsed, trapping and killing over 1,100 employees. It was not only the worst industrial disaster in the history of the garment industry, it was also the world’s most fatal industrial building collapse. News reports soon emerged that the factory owners had ignored ominous warning signs, such as visible cracks in the wall, and had illegally added several stories to the top of the building, creating a weight the building could not bear. Many of the factories operating in the building were producing apparel for well-known Western brands, such as Walmart, Joe Fresh, and Mango. Rescue workers struggled for over a week to reach trapped survivors, while hospitals tended to the over 2,500 workers who had escaped, many with severe injuries. Survivors told heart-rending tales of having lost mothers and sisters who had worked in the same factories. The deaths of so many innocent workers created a firestorm of controversy in Bangladesh and around the world. Accusations and recriminations were leveled at corporations and government officials. A period of intense and profound soul-searching ensued for the global fashion companies that made substantial use of outsourced factory labor in Bangladesh. Within a few months, two major initiatives were announced, one American and one European, to increase safety and accountability in Bangladeshi factories. In this chapter, we will explore the complex issues underlying the outsourcing of manufacturing and its relationship to sweatshops and child labor. While the horrific example of Rana Plaza might lead one to assume that sweatshops are always a bad thing, a closer examination reveals the limitations of a simplistic view. In fact, Bangladesh relies heavily on outsourced apparel manufacturing for the well-being of its citizens. Clothing factories employ over 3 million Bangladeshi citizens and the country obtains nearly 80% of its export earnings from the apparel sector.1 An outright ban on outsourced manufacturing would leave many poor Bangladeshis without a job. Although such jobs may not seem desirable from the perspective of citizens of industrialized countries, in developing countries these kinds of factories often pay more than the average salary. In this chapter’s debate section, we will ask ourselves what is the proper attitude of a major global brand toward manufacturing in a country like Bangladesh, which has suffered from a spate of manufacturing disasters in recent years. The company we will consider is Disney, which is known for producing toys, clothes, and movies aimed at children. Disney has been accused of producing goods in sweatshop factories that employ child labor. Obviously, Disney cannot afford to become known as a company that is unconcerned with the rights of children. What should they do? In order to discuss this issue, we first need to come to a more sophisticated understanding of sweatshops and their benefits and disadvantages. The term sweatshop refers to a factory that is guilty of some sort of labor abuse or violation, such as unsafe working conditions, employment of children, mandatory overtime, payment of less than the minimum wage, unsafe working conditions, abusive discipline, sexual harassment, or violation of labor laws and regulations. The US Government Accounting Office has chosen to define a sweatshop as any manufacturing facility that is guilty of two or more of the above types of labor abuses.2 However, it is important to understand that the term sweatshop is not just a legally defined term but a word that has entered the general lexicon and is used broadly. Historically, the term was first used in association with the manufacture of articles of clothing and apparel. Shortly after the beginning of the industrial revolution, which began in the United Kingdom at the end of eighteenth century and the beginning of the nineteenth, a rise in living standards led to a much greater consumer demand for clothing. Although the raw materials of clothing—fabric, yarn, buttons, and thread—could be produced efficiently in large, mechanized factories, the same was not the case for the final garment itself. To the present day, it has remained difficult to mechanize the sewing process involved in making clothing: The manual dexterity of a human being has always been needed in addition to a simple sewing machine. Consequently, the manufacturing of clothing has remained labor intensive relative to other industries. Another particularity of the apparel industry is that it is difficult to predict demand for articles of fashion. In any given year, some styles and colors will be wildly successful, while others will prove unpopular and need to be sold at a discount (hence the ubiquitous nature of discount sales of clothing). Given high labor costs and unpredictable demand, garment manufacturers turned to a system built on outsourcing production to middlemen who would then parcel out production to a number of small workshops. The middlemen were tasked with making sure that production deadlines were met, so they put pressure on the workshops and became known as sweat-ers, meaning that they made the workshops and their employees sweat. In time, these high-pressure workshops became known as sweatshops. By the 1830s, the abuse of workers in sweatshops had become a topic of social concern, and the United Kingdom passed its first Factory Act, which was then amended some 7 times by 1878.3 In 1844, Friedrich Engels, who would attain fame as Karl Marx’s intellectual partner and one of the founders of Marxism, wrote a critique entitled The Condition of the Working Class in England. As industrial production developed in the United States, sweatshops also became a major American political issue. Many of the Abolitionists who became famous for their staunch opposition to American slavery also fought against sweatshops, considering them a form of human oppression akin to slavery. By the 1890s, a number of groups sprung up to try to alleviate and control sweatshop conditions. By the first years of the twentieth century, New York City had become a center for apparel manufacturing and, consequently, for sweatshops as well. Tens of thousands of immigrant workers toiled in the sweatshops of an area that is still referred to as the Garment District, the heart of which lies along Seventh Avenue in midtown Manhattan. Despite the central role of the Triangle Shirtwaist Company in these actions, and despite the promises of improvement made pursuant to Brandeis’s mediation, it soon became clear that not enough had yet been accomplished. On March 25, 1911, a fire broke out in the Triangle Shirtwaist Company factory located next to Washington Square Park.6 With several of the main exits locked to prevent employees from stealing, only one exit was available and it was soon blocked by flames. Many workers succumbed to the heat and smoke while others, trapped by the growing fire, stepped out onto an eighth floor ledge, and when the heat became unbearable, jumped off. Dozens of young women fell to their deaths on the pavement below, creating a horrific image that would transform the entire industry. It was the worst industrial accident in the history of the United States. In the wake of the Triangle Shirtwaist Fire, a number of reforms were promptly undertaken in New York, with over sixty laws dealing with fire safety and labor rights passed by the state legislature in the first two years after the fire. These reforms were echoed and amplified throughout the United States and around the world in the decades that followed. In 1919, the International Labour Organization was created to protect worker rights.7 In 1937, the United States passed an important national statute on union and labor rights, the National Labor Relations Act.8 Despite these and other reforms, however, sweatshops stubbornly refused to disappear. In 1994, the US Government Accounting Office noted that thousands of sweatshops continued to operate in the United States.9 Rather than disappearing, the sweatshop problem would follow the international path of globalization and spread around the world. Globalization is a term that refers to the growing interconnection of the world’s economies. The globalization trend greatly picked up speed after international moves to lower import tariffs were instituted by the General Agreement on Trade and Tariffs (GATT) in 1947 and even more so after the GATT system was institutionalized in the World Trade Organization (WTO) in 1995. At the corporate level, one manifestation of globalization is foreign outsourcing, the practice of moving manufacturing operations to low-cost countries. Fashion and apparel companies were among the first to take advantage of the benefits of outsourcing. Throughout the period from 1970 to the present, employment in American apparel factories dropped sharply as companies moved production to countries like Indonesia, Vietnam, China, Mexico, and the Dominican Republic. The outsourcing movement was accompanied by increasing reports of sweatshop abuses. As a result, a number of nongovernmental organizations (NGOs) became involved in anti-sweatshop activities. One of these was an American organization called the National Labor Committee, headed by labor activist Charles Kernaghan. Kernaghan was devoted to ferreting out instances of sweatshop abuse in foreign factories producing for American brands, and then publicizing the abuses in an effort to shame the companies into changing their practices. Not surprisingly, both the factories and their American clients were quite reluctant to share information with Mr. Kernaghan. He therefore developed a number of sleuthing tactics; for example, he would surreptitiously trail the garbage trucks that picked up the factory’s waste, following the truck to the local dumpsite. Later, displaying remarkable commitment to his job, he would sneak in and rummage through the waste, looking for discarded office files. When he found the factory’s production records, often minutely described in spec sheets, he was able to determine who the client was and how much the client was paying for the labor cost included in assembling a particular garment. Another technique employed by Kernaghan was to find the local food stands where workers would go for lunch or coffee. There he would seek to engage the workers in conversation about the factory. This technique had to be employed with great discretion because, if a factory owner or foreman heard that a worker was collaborating with Kernaghan, there was a great likelihood the worker would be punished or fired. After several years of watching his reports go ignored by the mainstream media, Kernaghan finally broke a story in 1993 that would transform the public image of American outsourcing. Kernaghan discovered that a fashion line produced for Walmart under the label of a prominent American television personality, Kathie Lee Gifford, was manufactured in Guatemala in a factory that used child labor and engaged in a number of worker abuses. Although Kernaghan expected that this report would receive little coverage, he was unwittingly helped by Gifford herself, who went on the air during her popular morning show, Live with Regis and Kathie Lee, to tearfully deny the allegations. In the United States as in many other countries, any incident involving a media celebrity becomes fodder for the popular press. Kernaghan found himself at the center of a news storm. As Kernaghan and Gifford exchanged accusations and denials, the issue of sweatshop abuses came to the fore. Gifford eventually promised publicly to ensure that employment of children would cease and worker rights would be respected, and the controversy abated. Kernaghan has stated that, in the end, Gifford changed nothing of substance. Throughout the 1990s, a number of other sweatshop-related abuses came to light in factories used by American brands. Several of these involved the island of Saipan, a small American protectorate in the Pacific. A number of factory owners discovered that since Saipan is technically American territory, clothing produced in Saipan could enter the United States duty-free and carry the label “Made in America.” Since Saipan is much closer to Vietnam and the Philippines than to the United States, a number of these factories recruited Vietnamese and Filipino natives as factory workers. Upon their arrival in Saipan, however, some of these workers were exposed to flagrant human rights abuses and, in the worst of cases, outright slavery. In one notorious case, workers were literally imprisoned in the factory and forced to work without pay. Eventually, these abuses were revealed and US prosecutors filed charges against factory owners, some of whom were sentenced to substantial prison sentences. In the early 1990s, one of America’s most prominent footwear brands, Nike, also came under attack as reports emerged from Indonesia and Vietnam of worker abuse. In Vietnam, a young female factory employee was working on basketball shoes when her machine exploded and sent a bolt through her heart. The American cartoonist Garry Trudeau began featuring a series of strips satirizing Nike’s sweatshop factories in his popular newspaper cartoon Doonesbury. At first, Nike refused to accept responsibility, pointing out that Nike had never manufactured its own footwear and apparel. Nike’s contracts with its sourcing factories required the factories to obey labor regulations and, in Nike’s view, this meant that any abuses were the factories’ responsibility. However, by 1998, the continuing negative publicity obliged Nike to reverse course by instituting a strict code of conduct for its factories. Through the efforts of a crusading Secretary of Labor Robert Reich, the Clinton administration sought to leverage the power of the bully pulpit available to the US presidency. In 1995, the Clinton administration announced the formation of the Apparel Industry Partnership, a government–industry collaboration aimed at reducing instances of sweatshop abuse. Companies who were able to establish that they had produced their items in sweatshop-free environments would be allowed to add a special label in their clothes: “No Sweat.” It seems this approach was ill-advised, as no companies ever made use of it, perhaps because many people would be disconcerted to find a reference to sweat in their garments. In 1998, America’s college students created US Students Against Sweatshops (USAS), which has proven to be an influential public interest group. USAS’s initial goal was to convince American universities to eliminate sweatshops from the sourcing of college apparel, such as the sweatshirts and T-shirts bearing university logos that are commonly sold in campus stores and bookshops. Around the same time, a group of large American brands announced the creation of the Fair Labor Association (FLA), a group that set standards for certifying American brands as sweatshop-free if they submitted themselves to a regime of regular inspections. The FLA was viewed with suspicion by many antisweatshop activists and NGOs, in part because the FLA did not accept membership from unions, and also because it was felt that FLA’s principal approach, to reward corporations with certification for a few years of minimal inspections, was insufficient to truly eliminate sweatshop abuses. As a result, union groups and the USAS led the way in creating a rival group, the Worker Rights Consortium (WRC), which took a different approach. The WRC investigated reports of abuse and published its findings. In light of continued scrutiny from groups like the WRC, the USAS, the National Labor Committee, and other international groups such as the Clean Clothes Campaign, most large apparel brands developed and publicized their own internal codes of conduct for suppliers. Such codes of conduct were contractually imposed on all suppliers and required that factories comply with all local labor laws, refrain from employing children, and maintain safety programs. In addition, most brands began to require that factories make themselves available for inspections to make sure that they were complying with the standards set forth in the codes of conduct. A number of inspection companies sprang up to service the needs of the corporations and groups of young inspectors soon scanned the globe, moving from factory to factory, checking them for fire violations, reviewing records to make sure that rules on overtime were respected, and so forth. Despite all these efforts, reports of violations continued to be heard. The American consumer seemed to have wearied of the sweatshop issue to some extent, and companies like Walmart and Nike, which had often been accused of sweatshop abuses, saw their sales and stock valuations continue to rise. Many companies began to focus more on environmentalism and anti–global warming issues, and a number of brands began to require that their supply factories obtain some sort of environmental certification, such as the Bluesign certification that was established in Germany under the auspices of SGS, the world’s largest inspection company. Then, in 2012 and 2013, a horrific series of accidents—eerily reminiscent of the Triangle Shirtwaist fire that had occurred a century before—reminded the world’s consumers that the sweatshop issue was still with us. In 2012, a fire broke out at an apparel factory in Pakistan, killing some 270 Pakistani workers. Among the western companies sourcing from that factory were the UK retailer Tesco and the German apparel brand Kix. Kix’s offer of compensation to the victim’s families of $2,000 per fatality was viewed by many Pakistanis as insulting. Then, just a few months later, at the Tazreen Fashions factory in Dhaka, Bangladesh, another 112 factory workers perished in a fire. Again, it was discovered that well-known western brands such as Walmart, Disney, and the Gap has sourced products from the factory. The world’s attention was squarely focused on Pakistan and Bangladesh when the building collapse at Rana Plaza in Bangladesh became the worst industrial catastrophe in the history of apparel manufacturing. In light of the above history, it might seem startling that many experts appear to accept the existence of sweatshops as something positive. Economist Jeffrey Sachs, who is perhaps the world’s foremost expert on the eradication of poverty (he was the creator of the United Nation’s Millennium Project to cut global poverty in half) was quoted in 1997 as saying, “The problem with sweatshops is not that there are too many, but that there are not enough.”10 What did he mean by that? In general, economists are less disturbed by sweatshop abuses than are labor activists, but most economists would deny that this is because they are heartless or unconcerned with human rights. Rather, they concede that sweatshop abuses are both common and reprehensible, but they also believe that the benefits to the local economy from international outsourcing more than outweigh the harm. According to this point of view, sweatshops are part of the industrialization process and are an inevitable by-product of economic development. Factories in poor countries are able to attract foreign customers because local labor is cheap. As factories proliferate and employment rises, factories must begin to compete for better workers. Wages therefore increase, and factory conditions improve. With a broader tax base and greater economic growth, local governments are able to invest in the infrastructure for further development, building roads, hospitals, and schools. Some international research studies appear to confirm the economists’ point of view. One study revealed that, in most countries where the presence of sweatshops had been reported, apparel factory workers actually earned more than the average national wage.11 A number of countries have passed through a manufacturing phase in which sweatshop conditions were more prevalent on their way to full industrialization and a diversified economy. Examples include the United States, Japan, and Korea. Most recently, China appears to be following a similar path, though it is still in a transition phase and reports of sweatshop abuses are still common. The Walt Disney Corporation is one of the world’s largest entertainment conglomerates, known for its theme parks, such as Disneyland and Disneyworld; its long history of producing blockbuster animated movies from Fantasia and Snow White to The Lion King and Tangled; and its sale of licensed apparel and toys featuring famous characters from the Disney movies. Given that an important segment of Disney’s target market is children, the company is especially exposed to negative publicity related to certain sweatshop abuses, in particular, the use of child labor. After the 2011 Tazreen Fashions factory fire in Bangladesh, Disney management became concerned about the company’s public relations exposure due to its sourcing operations in Bangladesh. Although Disney’s apparel manufacturing was far from negligible, it still represented a very small percentage of Disney’s total earnings, which came predominantly from its television, film, and theme park divisions. One commonality to the Disney-branded products was that they all relied on Disney’s image as a wholesome provider of family fare. If Disney were to become tagged with accusations similar to those leveled at Kathie Lee Gifford—namely that it was the beneficiary of child labor in sweatshop conditions—the consequences could be quite devastating for Disney’s public image. What would Disney do if high-school students started nagging their parents to abandon Disney vacations or to stop renting Disney movies? Therefore, in early 2013, Disney decided to pull its manufacturing operations out of Bangladesh. That Disney departed from Bangladesh shortly before the Rana Plaza building collapse was misinterpreted by many as having been caused by the collapse, whereas Disney had actually made its decision well before the collapse. Despite this, many representatives of antisweatshop NGOs and workers’ rights groups condemned Disney’s decision as an abdication of responsibility. In the view of such critics, Disney should have stayed behind to help remedy the problem. Topic for Debate: Should Disney Return? In this chapter’s debate section, we ask, would it more ethical for Disney to stay in Bangladesh and use its considerable reputation to help lobby for improved worker conditions at Bangladesh apparel factories? We will assume for the purposes of this debate that the Disney Board of Directors has been pressured to reconsider its position. Two directors are preparing their presentations for an upcoming board meeting at which the issue will once again be discussed. One of the directors, whom we will call Mr. Jones, is one of the founders of an international NGO dedicated to worker rights. He was invited onto the board specifically because of his ability to speak to issues of human rights compliance in outsourcing factories. It is Mr. Jones’s opinion that Disney should resume operations in Bangladesh. On the other side is a director we will call Mr. Smith, who is one of the principal shareholders of the Disney Corporation. Mr. Smith is very concerned that a return to Bangladesh would expose Disney to major financial risk, because another factory catastrophe coming after Disney’s return could lead to Disney’s name being tarnished. You will be asked to help one of these directors prepare their presentation at the Board meeting. Disney should resume manufacturing in Bangladesh. Disney has sufficient prestige to help lobby for improved human rights compliance in Bangladesh. Disney’s departure may only encourage Disney’s suppliers and related parties to leave Bangladesh as well, thereby diminishing employment in Bangladesh and harming the local workers through unemployment. By helping support the efforts of other foreign companies sourcing in Bangladesh, Disney will learn state-of-the-art methods for working with governments and community groups to help improve worker safety, which can only serve Disney positively in the other countries where Disney sources its apparel products. Disney should not resume manufacturing in Bangladesh. Disney markets products to children and families; any reports of child labor or the deaths of teenage workers in factories could be devastating to Disney’s image. Disney should reward—with its factory contracts—those countries that are doing a good job in providing a safe working environment for its employees, free of sweatshop labor. Disney’s departure should help create an incentive for Bangladeshi authorities to improve conditions in their factories. If no foreign buyers leave, it is too easy for them to become complacent and do little to change the status quo. Posner, Michael H. “Disney and Other Big Brands Need to Address the Real Challenges to Outsourcing.” New York Times. May 2, 2013. http://www.nytimes.com/roomfordebate/2013/05/02/when-does-corporate-responsibility-mean-abandoning-ship/disney-and-other-big-brands-need-to-address-the-real-challenges-to-outsourcing. Kanzer, Adam M. “Disney’s Decision to Leave Bangladesh was Appropriate.The New York Times. May 2, 2013. http://www.nytimes.com/roomfordebate/2013/05/02/when-does-corporate-responsibility-mean-abandoning-ship/disneys-decision-to-leave-bangladesh-was-appropriate. Bhagwati, Jagdish. “Responsibility for Sweatshops is Local, Not Global”. New York Times. July 11, 2014. http://www.nytimes.com/roomfordebate/2013/05/02/when-does-corporate-responsibility-mean-abandoning-ship/responsibility-for-sweatshops-is-local-not-global. When you buy clothing do you check the inside label to see where the item was manufactured? Would it matter to you to discover that an item was manufactured in Bangladesh? If you found an article of clothing that had a label stating that it was manufactured in the United States, would this make it more attractive to you? What if the item was 20% or 30% more expensive, would that keep you from buying it? What is the best way to make sure the workers in factories are treated fairly? Can you come up with one detailed proposal? 1. Anu Muhammad, “Wealth and Deprivation: Ready-made Garments Industry in Bangladesh,” Economic and Political Weekly, 46, no. 34 (August 20, 2011), 23–27. 2. United States General Accountability Office, –“Sweatshops” in the U.S.: Opinions on Their Extent and Possible Enforcement Options, a briefing report to the Honorable Charles E. Schumer, House of Representatives, no. HRD-88-130BR, August 1988, www.gao.gov/assets/80/77185.pdf. 3. “The 1833 Factory Act,” UK Parliament, accessed October 28, 2013, http://www.parliament.uk/about/living-heritage/transformingsociety/livinglearning/19thcentury/overview/factoryact/. 4. M. L. Disher, American Factory Production of Women’s Clothing (London: Deveraux Publications Ltd, 1947). 5. Tony Michels, “Uprising of 20,000 (1909).” in Jewish Women: A Comprehensive Historical Encyclopedia, Jewish Women’s Archive, March, 20 2009, http://jwa.org/encyclopedia/article/uprising-of-20000-1909. 6. “The 1911 Triangle Factory Fire,” Cornell University, accessed May 5, 2014, http://www.ilr.cornell.edu/trianglefire/story/fire.html. 7. Savitri Goonesekere, “A Rights-Based Approach to Realizing Gender Equality,” UN Women, accessed May 5, 2014, http://www.un.org/womenwatch/daw/news/savitri.htm. 8. National Labor Relations Act, 29 U.S.C. §§ 151-169 (1935). 9. “Efforts to Address the Prevalence and Conditions of Sweatshops,” U.S. General Accounting Office, November 1994, http://www.gao.gov/archive/1995/he95029.pdf. 10. Allen R. Myerson, “In Principle, a Case for More ‘Sweatshops’” New York Times, June 22 1997, http://ww.nytimes.com/1997/06/22/weekinreview/in-principle-a-case-for-more-sweatshops.html. 11. Worker Rights Consortium, “Global Wage Trends for Apparel Workers, 2001–2011,” Center for American Progress, July 11, 2013, http://www.americanprogress.org/issues/labor/report/2013/07/11/69255/global-wage-trends-for-apparel-workers-2001-2011/.